More than 38 people have been convicted of illegally trafficking rhino horns from Africa resulting in more than $2.1 million in fines, $5.6 million in restitution and 438 months in federal prison as a result of “Operation Crash,” conducted by the U.S. Fish and Wildlife Service. Tim Santel, Special Investigations Unit supervisor for the U.S. Fish and Wildlife Service (FWS) in Nashville, Tennessee, provided an overview of the more than six-year undercover investigation that, so far, has charged more than 50 people. Named “Crash,” a term for a group of rhinoceros, the covert operation began in 2011 when FWS agents learned about increasing rhino poaching in 2009 and 2010. People were attempting to purchase rhinoceros horns that are used either as decorative libation cups or ground into a powder for aphrodisiacs sought in Asia. Between 1970 and 1992 rhino populations declined by more than 90%, and by 1992 only 2,000 rhinos survived in 7 countries. All five species of rhinos are endangered. Some of the libation cups made from the keratin of a rhino’s horn are worth up to a half-million dollars. Many libation cups were made in the 1800s for ceremonial functions and their high values can now exceed the cost of illegal drugs, such as heroin, and are being sought as status symbols by newly wealthy young people in southeast Asia. With a limited supply of the old cups made from horns, rhinos are being illegally poached today to provide cups for new collectors. Raw horns were being sold for $5,000 to $30,000 per pound, and carved horns up to $250,000. An organized crime syndicate out of Ireland was involved in the purchase of illegal horns, and thefts of rhino horns from museums in Europe. The rhinoceros is on the Endangered Species list and is in danger of becoming extinct. Recorded poaching kills reached a high of 1,215 in 2014, and since (after Operation Crash started arresting people and putting them in prison) have been going down slowly following the undercover investigation. “The investigation spanned the entire United States and is still going on,” Santel told 42 African conservation officials attending the International Conservation Chief’s Academy (ICCA) with their American counterparts to build relationships to help them fight illegal wildlife trafficking that is decimating rhinos and elephants. What began as a small case turned into the largest FWS investigation in the history of the United States, involving digital technology and undercover surveillance, search of luggage at airports, covert operations, informants, and work with foreign partners in order to apprehend violators who knew what they were doing was illegal. Tim Santel, Special Investigations Unit supervisor for the U.S. Fish and Wildlife Service, led a six-year undercover investigation of illegal trading of rhinoceros horns that has led to $2 million in fines, and $5 million in restitution. Santel said that undercover work is necessary in these types of cases because they need the evidence in order to get convictions in court, and prove that the violators knew what they were doing. “Sometimes an undercover operation is the only way to get the documented evidence that you need,” Santel said. Why would U.S. agents be interested in illegal sales of wildlife horns and tusks in Africa? Because the money and illegal wildlife crossed U.S. borders, U.S. presidents Obama and Trump have issued executive orders to combat illegal wildlife trafficking, and the killings could lead to extinction of rhinos and elephants in the wild of Africa within the coming decade. A video that Santel showed of a baby rhinoceros trying to get milk from its dead mother, which had been killed and its horn hacked off by poachers, put an exclamation mark on the reasons to end the senseless killing of this endangered species. The operation involved four investigations for: sale of raw rhino horns; sale of carved rhino horns; smuggling; and unlawful rhino hunting by U.S. hunters. Some U.S. hunters were going to Africa to shoot a rhino without a legal hunting license, and the outfitter would keep the horn and sell it. The investigators used subpoenas, search warrants, and undercover surveillance operations to obtain information showing records of purchases, shipments and possession of illegal white and black rhino horns and libation cups. By February, 2012 the investigators had the information and documentation they needed and the investigation changed from covert to overt. 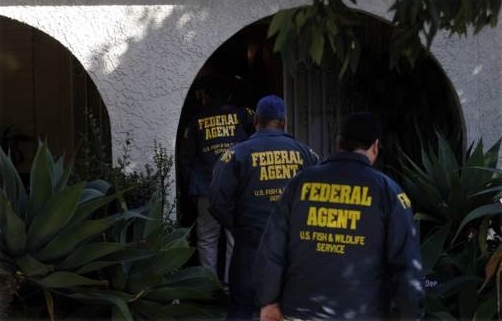 More than 140 USFWS special agents and conservation officers in some states used search warrants to seize evidence, including numerous rhino horns, over a million dollars in gold and cash, that would later be used in court. Violators were charged with violations such as mail fraud, conspiracy, violations of the Lacey Act and Endangered Species Act. The operation and subsequent convictions has resulted in adding the white rhino to the Endangered Species list, some states enacting bans on sale of rhino horns and elephant ivory, and Congress strengthening laws on illegal trafficking. Santel notes that President Trump signed an executive order on February 9, 2017 that included wildlife trade for investigating transnational criminal organizations. The money that results from confiscation of illegal funds can be sent to Conservation Funds and some proceeds were used to purchase land in Kenya to help preserve the rhino, where a baby black rhino was born recently. Some work on Operation Crash is still continuing, including work that special agents are doing stationed in overseas countries, as several people are still awaiting trials in the United States. Santel and his team involved in Operation Crash were selected to receive the Samuel J. Heyman Service to America People’s Choice Award in 2016. Known as the “Emmy’s of Government Service,” the People’s Choice Award was voted upon by the public and recognizes excellence by government employees. Santel, Jim Gale (FWS special agent in charge of the Southeast Region), Ed Grace (FWS acting assistant director of law enforcement), and Dave Hubbard (special agent for international operations) were honored at a banquet in Washington D.C. This work by the FWS special investigation unit emphasizes that it is important to stop illegal wildlife trafficking and shows the success and impact that highly trained investigators can make to help endangered wildlife species. National Conservation Training Center, Shepherdstown, West Virginia--- Lewis Rather, retired Texas Game Warden with the Texas Parks and Wildlife Department, has no use for poachers. “Poaching is very personal to me, it is stealing from every one of you and from me,” he told 42 African conservation officials attending the International Conservation Chief’s Academy (ICCA) to help build relationships and help fight illegal wildlife trafficking. Following his retirement from the Texas Parks and Wildlife Department, after 35 years in wildlife law enforcement service, Rather became Executive Director of International Wildlife Crimestoppers, a 501(c) (3) non-profit corporation that helps to stop poaching wherever it occurs. The organization originally began in 1997 in seven states, and now works internationally helping to reduce illegal wildlife trafficking by engaging communities in deterring and apprehending wildlife poachers. The organization partners with conservation agencies and organizations to support the sustainable use of natural resources, and deter poaching around the world. Its mission is to reduce the illegal take (poaching) of the world’s fish and wildlife resources through the exchange of information with anti-poaching organizations. “We all need to work together against poachers.” Rather said. The major emphasis of the organization is information, education, and apprehension. People can call in with information on violations that then will be passed along to the agency handling enforcement of fish and wildlife laws. Lieutenant Wayne Saunders, a 22-year veteran of the New Hampshire Fish and Game Department and former president of International Wildlife Crimestoppers, described how important it is for a game warden to develop a network of contacts with local people in the community. Operation Game Thief is an anti-poaching program that can be run in any state. Operation Game Thief works alongside International Wildlife Crimestoppers to provide information that helps game wardens do their jobs effectively. Times have changed and law enforcement needs to also change and adapt, and Saunders said that Operation Game Thief and International Wildlife Crimestoppers can help to give law enforcement critical, timely and accurate information on wildlife poachers. Each state has some community-based information-gathering tool to receive information on wildlife violations. Sometimes it is an (800) number, sometimes a telephone tips hotline, or a Facebook page or texting. Sometimes Saunders said that some of the best cases come from information provided by friends or ex-spouses. The amount of the payout depends on several factors, including whether the violator has had a prior conviction, the number of citations issued, the amount of the fine imposed by the courts, what civil restitution is required for the wildlife harvested illegally, and the involvement of the informant. One of the tools used by the New Hampshire Department is to have a travelling trailer that contains a “Wall of Shame,” displaying mounted animals that were taken illegally. The trailer is taken around the state to different events, and often draws the interest of young people. One of the points of emphasis is youth education. The program specifically reaches out to youth in order to have them understand the importance of wildlife laws, and the harm poachers do to wildlife. More information on these programs can be found at: www.wildlifecrimestoppers.org and www.operationgamethief.org. On Monday, October 2, 2017, the Northeast Conservation Law Enforcement Chiefs Association (NECLECA) held their annual meeting in Stroudsburg, Pennsylvania at Trout Lake Conference Center. This marks the seventy-fifth anniversary of the inception of this organization. For three days in August, 1942, the various law enforcement chiefs of fish and game agencies from the northeast states met to form an organization to enable them to formally discuss items of mutual interest. The states of Connecticut, Delaware, Maine, Maryland, Massachusetts, New Hampshire, New Jersey, New York, Ohio, Pennsylvania, Rhode Island, Vermont and West Virginia were elected into membership. At the first meeting, items of discussion included training, the sale and transportation of deer, undercover methods, cause and remedy of hunting incidents and equipment issues. During the most recent meeting, all the states mentioned above, except Ohio, were in attendance along with the State of Virginia and agents from the U.S Fish and Wildlife Service, and NOAA’s Office of Law Enforcement. While the profession of a conservation law enforcement officer has expanded and become more challenging in the past 75 years, protecting the nation’s natural resources is still our core function. During the current meeting of NECLECA, the chiefs heard presentations on traditional issues such as hunting related shooting investigations, exotic fish and wildlife sales, but additionally equipment discussions have developed into issues such as an in-depth training on body worn camera issues. In 1950 there were 38 conservation officers in New Hampshire. The state’s population was half a million. Today the state population has nearly tripled to 1.4 million, and tourism has increased from nearby population centers of Boston, Baltimore and New York. Snowmobiling is popular. ATV use is exploding. They have added spring and fall turkey seasons to enforce. They have a limited moose season now. They still have only 38 conservation officers. David Walsh, 44, is one of those officers. He’s a 19 year veteran, currently a lieutenant with the New Hampshire Fish and Game Department. Considering weekend duty and vacations that usually means there are about 15 wardens in the field on any given day in New Hampshire. Hiking is extremely popular in the state, both in mountain areas and on the Appalachian Trail, which passes through the state. Helping people who have become injured or lost while hiking in remote areas is a now a major part of their work load, a “partially funded” mandate, he said. ATV use is the fastest growing outdoor sport, again requiring search and rescue from wardens. A dollar from the ATV registration fee goes to search and rescue, but most years that falls about $200,000 short of what they spend on ATV-related rescues. Hikers can fill out a voluntary hiking card that brings in about $60,000 annually to the department. Meanwhile, they still have to perform their traditional job of regulating hunting and fishing. “We definitely spend more of our time now on the non-consumptive user than the consumptive user,” he said. The number of hunters in the state has dropped slightly in recent years. The number of fishing licenses have remained the same. They have 14 miles of coastline. Wild turkeys were reintroduced to the state in the 1970s and 1980s and are doing well. They now have spring and fall turkey seasons. They have moose – more than Vermont, fewer than Maine, he said. They started a moose hunting season in the mid 1980s. At its peak they were issuing over 600 moose permits per year. In recent years they have been issuing around 50. Moose numbers have dropped, probably related to stress caused by winter ticks, he said. The trend in milder winters has been helping the ticks. The focus of the International Conservation Chief’s Academy has been on preventing wildlife tracking. Walsh suspects there is reptile trafficking going on and possibly other trafficking, but they don’t have the manpower to investigate it, Walsh said. “To really get a handle on that, in my, opinion, you need a covert operation. That means extra staff, extra training,” he said. Given the demands on the 38 conservation officers, the state Legislature would have to prioritize wildlife trafficking and allocate additional funding in order for us to effectively to pursue wildlife traffickers, he said. Walsh grew up near Boston, but spent summers as a youth in New Hampshire. After a chance meeting with a warden at age six, he decided this was something he might like to do. It’s been a great career, despite some obvious challenges. “There is a different challenge every day, and a conservation officer's office is in the woods,” he said. Walsh encourages young people to consider a career in conservation law enforcement.